Nolan Cabrera of the University of Arizona. Anti-immigrant rhetoric going on in presidential politics and a potential state law have added a renewed emphasis on developing required ethnic studies classes in the LA Unified curriculum. 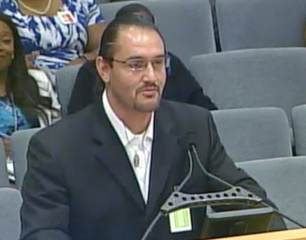 An expert from the University of Arizona spoke to an LA Unified school board committee this week to explain the importance of ethnic studies in education. He brought in some statistics to show the benefits. In Arizona, pilot schools targeted low-performing students and gave them Mexican-American studies courses. The schools saw that attendance, class scores and graduation rates all improved, Cabrera said. Attendance went up by 21 percent, grade point averages went up by 1.4 points and students added 23 credits to their curriculum, Cabrera said. School board members Scott Schmerelson, Steve Zimmer and George McKenna at the meeting all expressed support for the ethnic studies courses. McKenna said that he hoped that the Ethnic Studies Task Force starts meeting again, and asked to district to support the programs. Derrick Chau, the director of Secondary Instruction for the district, said they are now developing a strategic plan for implementing ethnic studies across the district and are revising three English language arts classes to align with ethniic studies. Chau said the district is planning professional development for teachers, too. Jose Lara of Ethnic Studies Now is fighting for the classes throughout the state and said seven districts have already taken the lead in making the courses a graduation requirement. The LA Unified school board voted to do that in 2014, but the plan became stalled because of potential costs in training teachers and an estimated $72 million for textbooks. Lara and Cabrera were actually both students at UCLA graduate school and started the Raza Graduate Student Association together to support Latino grad students. “We would talk about one day bringing ethnic studies into high schools and look at us now, in two different states doing the same type of work,” Lara said. Next week, Lara said he has meetings with district officials about starting the Ethnic Studies Task Force meetings up again. The classes are now in 40 high schools as electives. After Lara’s presentation at the last school board meeting, Sylmar High School principal James Lee asked to bring ethnic studies to his school, and he contacted six east San Fernando Valley high schools about doing the same thing. Lara said another impetus for LAUSD is a bill sponsored by state Assemblyman Luis Alejo, (D-Watsonville) requiring every school district and charter school have a high school required ethnic studies course beginning in the 2020-2021 school year. Gov. Jerry Brown vetoed a bill very much like that last year because it created an advisory panel that duplicates the work of the state education department. Lara said the new bill will most likely pass. The San Francisco and San Diego school districts have already started on the path to required ethnic studies, and Lara said he is doing a presentation next week in Fontana for all their schools.